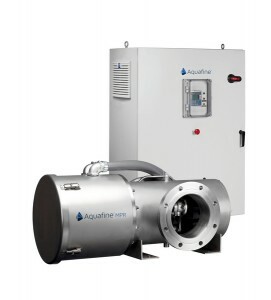 Utilising medium-pressure lamp technology, the MPR Series for disinfection and chloramines reduction are the systems of choice for meeting the rigid quality standards of the Recreational Water market. The MPR series consists of 316L stainless steel, matte finish treatment chamber and a UL Type 12 painted carbon steel control cabinet, featuring a microprocessor-based controller an optional automatic wiper. The incorporation of MP high intensity ultraviolet (UV) lamps reduces the number of lamps by 90%, reducing footprint, downtime requirements, installation and maintenance costs. Utilizing medium-pressure (MP) lamp technology, the MPR Series is well suited for flow rates greater than 25gpm given the efficiencies gained in meeting dosage intensive applications while being economically competitive. With a reduced footprint, higher flow rates and state-of-the-art MP technology, Aquafine’s MPR systems are an innovative, reliable and environmentally responsible alternative. MPR systems are CE compliant, as well as cULus and NSF 50 certified.